Wheel alignment is a part of standard automobile maintenance that consists of adjusting the angles of the wheels so that they are set to the vehicle manufacturer’s specification. The purpose of these adjustments is to reduce tyre wear, and to ensure that vehicle travel is straight and true (without “pulling” to one side). Alignment angles can also be altered beyond the maker’s specifications to obtain a specific handling characteristic. In its most basic form, a wheel alignment consists of adjusting the angles of the wheels so that they are perpendicular to the ground and parallel to each other. Wheel Alignment is often confused with Wheel Balancing. The two really have nothing to do with each other except for the fact that they affect ride and handling. If a wheel is out of balance, it will cause a vibration at high speeds that can be felt in the steering wheel and or the seat. If the alignment is out, it can cause excessive tyre wear and steering or tracking problems. 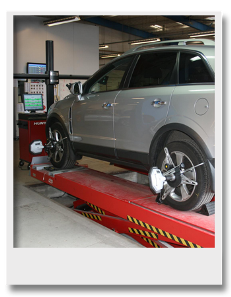 Four wheel alignment – the essential service! Misalignment is a major cause of unnecessary tyre wear. A properly aligned vehicle can add thousands of miles to tyre life. Fuel consumption decreases as rolling resistance decreases. A correctly set four wheel alignment along with proper tyre pressures minimises the rolling resistance. By preventing premature tyre wear (and early tyre disposal) and improving fuel economy and carbon emissions, it not only reduces the cost of motoring, but will help the environment too! Does your vehicle pull to one side? Do you constantly have to move the steering wheel to keep your vehicle travelling straight ahead? Many handling problems can be corrected by four wheel alignment. With all the system components aligned properly, road shock is more efficiently absorbed for a smoother ride. Misalignment can affect handling and can make the vehicle unsafe. A suspension system inspection is part of the alignment procedure; this will help highlight any worn or damaged parts before they become a more costly problem. With a wide range of services available, you can be sure that no matter what the problem is our experienced & highly qualified team will return your car in excellent condition. Copyright © 2018 DF Crash Repairs All Rights Reserved.